"A few months back my son and I were watching football and the phrase "domestic violence" kept being used. Finally he looked at me and asked "what does that mean?" I gave him a brief explanation to which he responded, "why would someone do that?" That sat with me a bit. I have several family members who are survivors of abuse, and yet I still had no answers for my 11-year-old son. My girlfriend's work usually does a donation, but decided not to this year. I knew she wanted to do something, so I offered up another option: let's make bracelets and sell them with 100% of the money going towards ending domestic abuse. 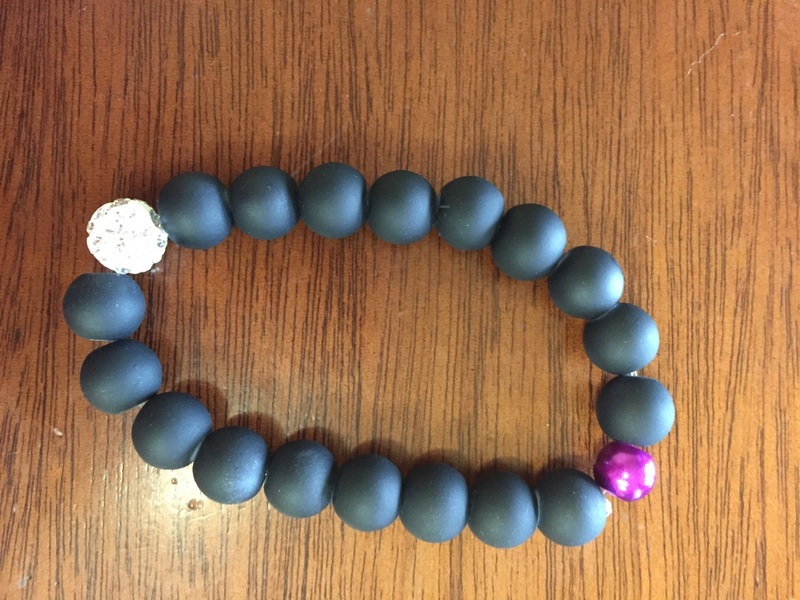 We started making all black beaded bracelets with a single purple bead. The black symbolizing the darkness, the silence, and the bruises of both physical and emotional abuse; the purple being the color associated with domestic violence. We have created a few variations with other symbolism...some have a crystal bead added for hope, while others are white symbolizing a fresh start. All bracelets will include a purple bead. We are hoping that will start a conversation and get the dialogue going while earning money to donate. TEC Beads have a passion for helping those in need. Born from that desire, their handmade bracelets are sold to help end domestic violence." The Marjaree Mason Center has been the recipient of their very generous donation, but we also revel in the passion this family has put into joining our cause to end domestic violence. If you would like a bracelet of your own, visit TEC Beads Instagram page here. Bracelets start at $10 and can be purchased by emailing tecbeads@gmail.com. Be a model of positive masculinity. As a man it is your job to model to other men how to respect and love women. Young boys and men are constantly being inundated with negative images of women, ideals of the inferiority of women, and negative conceptions of women due to female portrayal in the media. It is up to individual communities and the men within to provide positive examples of how to treat and love women and children the right way. Speak out specifically against domestic violence. At the community level domestic violence can go unnoticed. Although you may not be aware that your neighbor is physically (hyperlink to DV 101 article) abusing his partner or your friend from the office is emotionally (hyperlink to DV 101 article) and financially (hyperlink to DV 101 article) trapping his wife and children, this does not mean that it isn’t happening. Families suffering from abuse are excellent at hiding it. Even if you do not think that it is occurring in your community, starting a group against domestic violence, raising awareness, and speaking out could lead into the eventual knowledge of friends or loved ones experiencing intimate partner violence and hopefully lead to their safety. Challenge the stereotypes of what it means to be a man. The stereotypical “macho” man is known as strong, dominant, and powerful. As a man in any community it could be beneficial to challenge these stereotypes. Fathers, grandfathers, brothers, and uncles should be compassionate, gentle, sympathetic, and affectionate and still identify as a “real man.” This also includes confronting any comments, stories, or jokes involving sexism, racism, homophobia, or prejudice. Domestic violence is a form of exerting extreme power and control over another human being, this behavior is never okay. Reach out to women you many know experiencing domestic violence. Women who are involved in a domestic violence relationship are in constant fear. Due to physical, emotional, and sexual abuse these women are led to believe that they are inferior and isolated. If a man, who exemplifies strength and respect, offers their help, this could help change the life of the woman or family in danger. Remember never to blame the victim or vocalize any judgements on their abuser. Stay positive, know your limits, and offer continuous support. At the Marjaree Mason Center we welcome the help and support of men looking to speak out against domestic violence and join us in our fight to stop it. If you or someone you love is experiencing domestic violence, or you are seeking more advice on how to help, call Marjaree Mason Center’s 24 hour confidential hotline at 559.233.HELP (4357).